If you selected the annual payment plan, we will charge the full amount of your dues, subject to applicable taxes, charges, and processing fees, to your card on file once every year on the annual expiration date of your membership each. If you selected the monthly payment plan, we will charge 12 monthly payments in the amount corresponding to your membership type, subject to applicable taxes, charges, and processing fees, to your card on file on the last day of every month for each year of membership. Your membership will renew automatically unless you withdraw from the program (Please refer to V, “Cancellation”). II. Payment Terms: The Authors Guild accepts credit and debit payments by VISA, MasterCard, Discover and American Express. If paying using a credit card that belongs to your institution, you agree that you are an authorized user of said credit card. In the event that you become no longer authorized to use the card, you are responsible for updating and replacing the credit card information on file through your online renewal process or by contacting The Authors Guild Member Services at staff@authorsguild.org. We will notify you by e-mail or phone if your card on file is declined or we are unable to charge it for other reasons. You will be responsible for updating your payment information within 15 business days of notification to continue your participation in the automatic membership renewal program. If unpaid dues are not rectified within 60 days of the due date, we may terminate your membership from The Authors Guild. III. Notifications: We will send e-mail notifications about upcoming charges to your e-mail address on file with us 30 days and 15 days before their due date and a receipt of payment after receipt of payment. IV. Reserved Rights: The Authors Guild reserves the right to end the automatic membership renewal program at any time with at least 30 days notice. 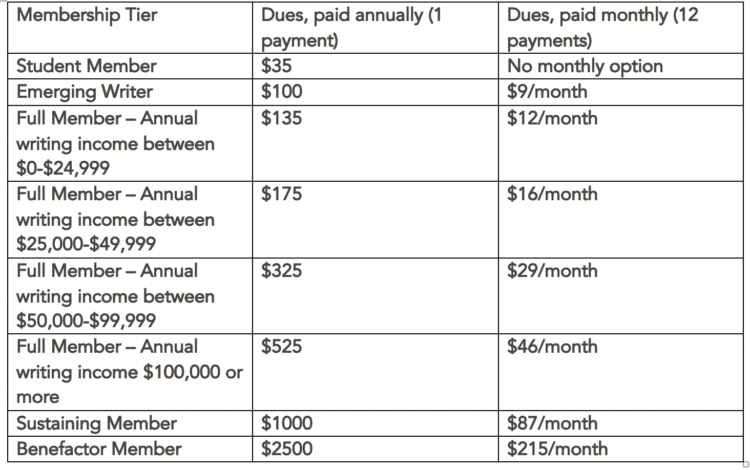 The Authors Guild also reserves the right to deny automatic or monthly payments to any member for any reason and the right to change annual membership dues rates, any changes to which will not go into effect until the next calendar year. (a) Affect of Early Cancellation On Monthly Payment Plan: If you withdraw from the automatic membership renewal program before making all 12 dues payments for the year, you authorize us to charge the remaining amount to your card on file at the time of your withdrawal.